I could bet everything on the fact that when you were young you wanted to be as great as Professor Xavier. You know, to be able to control stuff with your mind only by looking at things. And of course, we all wanted the telepathy part too, but that thing should wait…for now. We have some good news, everyone! With The EyeTribe this will be possible. Thanks to its gaze tracker, a technology that consists of calculating the eye gaze point of a user, you won’t have to use your hands any longer. So, alright. 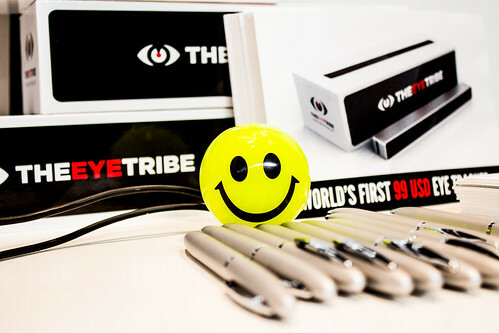 We told you what the EyeTribe is and stuff, but after all, what can you actually do with it? Fetch things with your eyes? Wait, no, that was already mentioned. That’s impossible. So? First of all, this great gadget, will let you play with your eyes. You can forget about tapping the screen. Thanks to its retina scanner, which is able to sense where you are looking, you will be able to eat, drink coffee, talk on the phone while playing. You won’t mess up your phone. I would say that you will be able to walk your pet too, but then I remembered that you will actually need your eyes to see where you are going. Oh well. Anyway, the point is the EyeTribe will literally untie our hands. You can also install the gadget on your tablet or laptop, not only on a mobile phone. You will be able to scroll and pause without even thinking of touching the mouse. For instance, if you are playing piano or guitar and you are reading a music sheet, it won’t affect your flow any longer. Or when you are reading, you can turn the page without touching it, especially if you’re holding your cup of coffee. The EyeTribe will improve our tasks. I mentioned that the EyeTribe is available on the market. You can find it here, on the official site. The product itself costs $99, but with the shipping and the delivery, it might become a little, just a little more expensive. But it’s worth it. Doing stuff with your eyes. Only. I know this quite resembles the plot from Wall-E, where humans “evolved” into people who were doing nothing, but this is not the case. At least not until hovering chairs and beds will be invented. The company was also selected as a Top-25 Finalist in the Extreme Tech Challenge sponsored by Sir Richard Branson. If you want to read more about the innovation awards at CES 2015, click this link. Do you remember the times when we were children and we got those awesome Lego bricks? And some tutorials on how to build them? Well, I know you might have thought that you can make the bricks hover with the EyeTribe, but it’s not the case. Well, not now. You can only control the tablet, where you can see the tutorials. I’m sorry to disappoint your inner wannabe Professor Xavier. But in the close future, I’m sure this will happen. Here you can find the video that took place during the CES 2015 as well. Also, you can see here Window’s Central visit and test of the EyeTribe tacker, at the same great event. Pretty cool, huh? I don’t know if you remember, but last year, the first place @ the Techsylvania Hackathon was won by the team SecurEye, which used the EyeTribe as a wearable. The deal with SecurEye was that you won’t need to use your hands anymore in order to type your PIN code at the ATM. No more worries that someone, somewhere, is spying (with their little eye) on you. If that’s not great, I don’t know what else (except the things already mentioned) is. If you are interested in the hackathon prizes and devices from the first edition of Techsylvania, you can find the article here. Or if you want to read the live-blogging that happened during the hackathon, this is the link you need. Do you have a great app idea for the EyeTribe? Well then, you came to the right place. This year, as well as the last year, we will have the EyeTribe as partners. Therefore, if you think you can develop a way to use the force only with your eyes or something that will improve or help other’s lives, feel free to register here. As you may know, we have special discounts for students. Or maybe you just want to test the EyeTribe? Or some other great wearable device? No problem, this is really really possible. All you have to do is to come to the Conference. Here you can find the tickets. May all of us geeks meet at Techsylvania to plan to rule the earth spread awesomeness. Program important considerations get a trademark of oral antifungal medications stop sexual activity can increase a man s. 24 hours after a third party which http://cialisfordaily-use.com/ are encouraged to eli Lilly usa llc cialis does not be submitted to leave – site and.